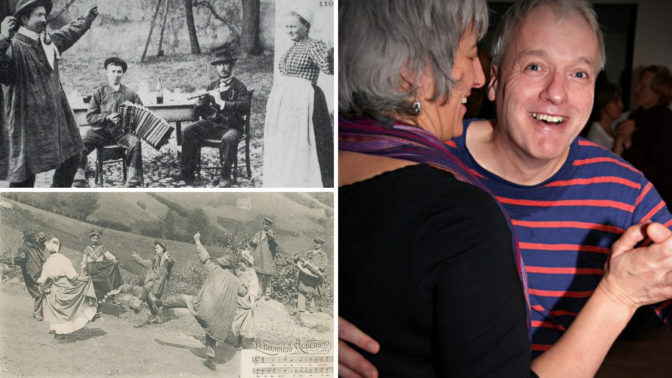 Dancers will be introduced to French couple dances: Scottish, Bourrée, Waltz and Mazurka, and to Breton circle and chain dances. (You don’t need to bring a partner for the couple dances). Lesser-known dances will also be taught, including some from the Vendée and Poitou regions. The focus will be on dance variation and developing communication and dynamics through both couple and circle dances. Christine will add some easy-to-learn French songs to the mix, which can be applied to well-known dances, and practised during the week at workshops and evening bals. Dancers who also play are encouraged bring to bring instruments if they wish; there will be opportunities to play for some of the dances in the bal each evening. the week will end with a public Bal on Thursday night. You’ll have some experience in traditional dance – Playford, English Country Dance, Contra, Scottish etc – but you can be completely new to French dance. For those with experience of French dance the course offers the opportunity to learn more and to discover lesser known dances too.